Rating: It’s been a while since Sunburst Radio hasn’t it? You remember – the debut Daytoner full-length released back in 2012 when it was all about one man, his samples, the occasional original tune and the odd mate popping round to add vox or instrumentation? Since then, that man, Steve Cantrill – known to all and sundry as ‘Moss’ – has surrounded himself with a six-piece live band, hobnobbed with Craig Charles and rocked multiple festival slots to great effect. 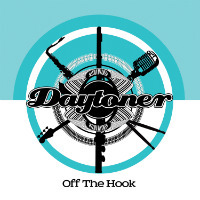 Two neo-northern soul 45s (the excellent Needed You and Second Stomp) down the road in this incarnation and the band have just released their first album as a live act – Off The Hook. It was the logical culmination of a live project which has seen what were originally performances of Cantrill’s sample-based dj edits augmented by live instrumentation and new vocals. As the act developed, the samples were replaced by fully live instrumental versions of the edits (some of which form the basis of the LP – hence the title) while the final step was the writing of all-original material which comprise the balance of tracks on Off The Hook. It’ll come as no surprise that all cuts off both recent 45s feature on this which means there’s a healthy dose of neo-northern soul action on the album. Thus the band re-imagine music first penned by a certain Mr S. Wonder esq. 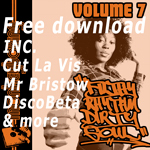 – albeit with new lyrics from singer Lucy Richards – on Second Stomp which will have the floor uptight along with northern jazzy shuffle Sicka, club burner Needed You and non-single cut Live Wonder. The flip of Second Stomp wasn’t northern soul of course but funky breakbeat groove (and fan favourite) I Get By which recalls something you might have heard on the Breakin Bread label over the years. Elsewhere, opener, The Winning Hand Is Mine provides swinging thrills, there is a smouldering soul torch song (in the form of the aptly-named Stop & Go), soul-jazz grooves (the loping Pacific and sultry uptempo bump Games) and the hybrid Cloud 160 – a catchy stomp inflected with both jazz and psychedelia. Finally, all the stops marked ‘horns’, ’emotive piano and backing vocals’ are pulled out for soaring closer I Did It For Love‘s tale of heartbreak. Off the hook indeed!